Erich Wegner was born in Gnoien, Mecklenburg, and moved to Rostock with his family when he was a youth. There he worked as a scene painter for the theater, until he was recruited into the military in 1918. When he returned from his time in the service, he attended the School of Applied Arts in Hannover and opened his own studio there in 1924. He exhibited works at the Art Association in Hannover in 1927, and, in 1929, he was included in the Neue Sachlichkeit exhibit in Amsterdam. 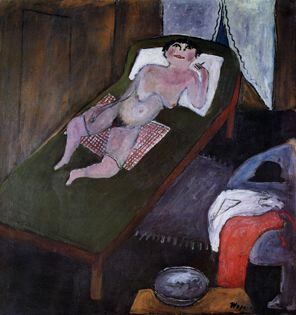 His work was shown infrequently between 1933 and 1945, but at the end of the war Wegner became an instructor at the Vollkshochschule in Hannover. His work appeared in numerous exhibitions throughout Europe over the next few decades. A retrospective exhibition of his work was held at the Art Association in Hannover in 1970. Wegner died in that city in 1980.